This month the March Art Elements Challenge is sponsored by Cathy Spivey Mendola and the theme nests is perfect for a month when we are beginning to see all sorts of birds building nests. 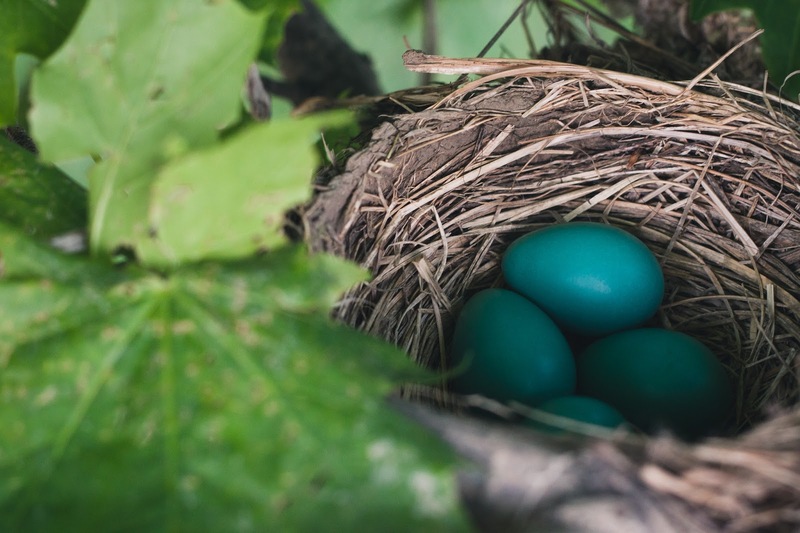 Some nests even have some eggs. Even though we could allow our imaginations to run wild, I went for a literal interpretation. 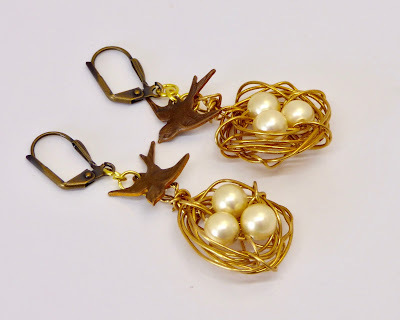 I thought that I would make a cute pair of bird nest earrings. I made a pair last year with some natural brass wire and I saw this as an opportunity to make another pair. I wanted to see how these earrings would look with brass wire. Before I made them, I have to admit I was really thinking they would be too gold for my taste. 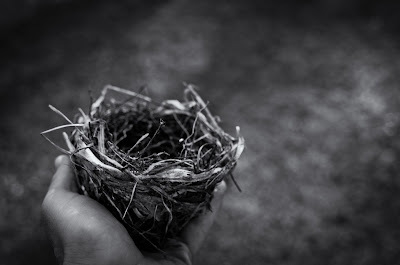 Next I had to decide what to put in my nests. I went to my favorite bag of pearls. This bag holds vintage glass pearls from wedding gowns. It is a wonderful collection and so special. I thought that I used the same shade of pearls as I selected for the first pair. Looking at the photos I am wondering! It amazes who the gold wire brightens up all the parts of the earrings. For that reason, I like the gold wire the best. These gold nest earrings are sure to be loved and cherished as a gift for Mother's Day, for a new Mom or for any bird lover's. It's nature at it's finest! One of these days I am going to make a necklace with a nest and a bird in the center. I know exactly what kind of chain I am going to use. Once again I will have to decide between natural brass or brass. What are your thoughts? I can't wait to see what all of the participants made for this challenge. Join me for the fun. My favourite is the natural brass, they look so restful. Beautiful earrings. I love your nest earrings! they are both lovely but I typically lean towards the warmer natural brass when creating. The brighter brass really make the pearls 'pop' though! Adorable earrings. I am partial to the darker wire for something I would wear, but both finishes look great. Love both nests - each has its charm! I like how you've added the birds - it's like they're protecting their nests, crying out warnings about not coming too close to their eggs. I'd love to see your necklace when you make it. They're beautiful, I love the addition of the little birds. I can't make my mind up about which colour I'd choose though.. they're both fabulous! Lovely earrings! I usually prefer brass too, but I agree with using the gold wire for these earrings. It does brighten up the pearls and add an elegance to them. These are really cut, personally I like the natural brass more because I like the aged look. 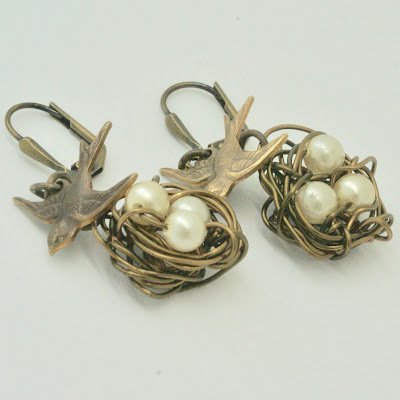 Love the nest earrings, they are charming and I honk would be popular. I myself, prefer the more aged metal, but I always like aged over bright.... thanks for joining us! Thank you for playing along with us! I love how the use of the brass wire makes the earrings look so much "warmer"...warm and cozy like a real nest. I think both of your earrings are great, but I think the warmness of the brass calls to me more than the gold. I've always wanted to make one of those beaded nests, but never seem to get around to it. You may have inspired me to do so! Great job Kathy! Cute nest earrings, Kathy! I've never been brave enough (or confident enough in my wire skills) to try anything like that. Yours turned out so nicely. Kathy, love your nest earrings! As with Sarajo, wire intimidates me a bit- you did a great job!